A quick update on Seoul shopping scene this month! This time I went to Hongik University, or Hongdae in Korean, a college famous for artistic and innovative students. The neighborhood is quite eccentric due to the nature of art students here, so much different from Sinchon - which is where my university Yonsei located, and sits right next to Hongdae! And FYI, this is where Yoona and Jang Geun Suk filmed their cofffe house scene in Love Rain. I wandered around Hongdae for one Saturday afternoon, and found so many lovely things. The number one trend on the street seems to be FLORAL! Floral prints are on skirts, dresses, shirts, even shoes and accessories. Seoul is so ready for summer based on the outfits on display in all the shops. 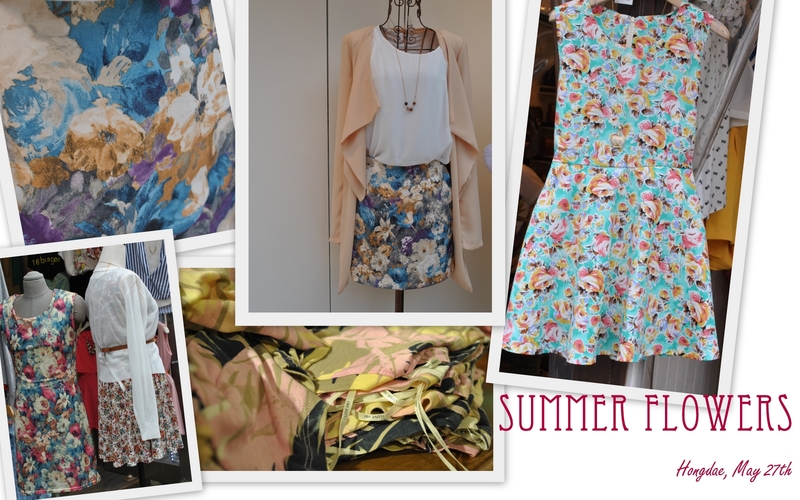 So stock up on floral prints, the girls here cannot have enough of them! Hi! May I know how to get this particular Hongdae shopping street?